In a twist to the tale of two rival billionaire brothers in India, a bankruptcy filing by Anil Ambani’s wireless carrier could have one clear winner -- his elder sibling’s disruptive mobile phone unit. The process initiated Friday in Mumbai, once admitted by the court, would leave Ambani’s Reliance Communications Ltd., or RCom, 270 days to repay debt or liquidate. The company voluntarily took the step after a planned sale of tower, spectrum and fiber assets to older sibling Mukesh Ambani’s Reliance Jio Infocomm Ltd. stalled. The Rs 173-billion ($2.4 billion) deal had prompted objections and lawsuits from creditors seeking payment ahead of the sale. Now, the elder Ambani could have even more leverage in bidding for the assets of a company whose demise he helped hasten by pushing his way into the mobile phone market in 2016 with free services. Mukesh Ambani can only vie for RCom’s wireless carrier assets because a top court in January relaxed rules that had prevented family members of controlling shareholders from bidding for companies going through insolvency. ALSO READ: Were Jeff Bezos' plans to dominate Indian e-commerce ambushed by Ambani? “The value of RCom if it goes into liquidation will be destroyed and with this sword hanging, the bidders may negotiate harder in the insolvency process with creditors and bring down prices,” said Apurva Jayant, a partner at law firm L&L Partners. RCom’s equity holders are already shorn. The company’s shares plunged a further 23 per cent Tuesday, bringing their two-day plummet to 49 per cent as of 11:30 a.m. in Mumbai. India’s former No. 2 wireless carrier announced its decision to file for insolvency Friday after market hours. Other listed parts of Anil Ambani’s empire have also taken a pounding. Since Friday’s close, Reliance Capital Ltd. is down 17 per cent, while Reliance Power Ltd. has slumped 41 per cent and Reliance Naval and Engineering Ltd. has sank 22 per cent. The downfall signals another inflection point in the dueling fortunes of two brothers in India’s richest family. It’s also a convenient turn for the elder brother. Mukesh Ambani is now Asia’s richest person as the value of his Reliance Industries Ltd. flagship’s shares gained, buoyed by the wireless carrier he founded only two years ago. Reliance Jio didn’t respond to email seeking comment on Monday. Still, a sale of RCom assets to Mukesh Ambani isn’t inevitable. While one court in January cleared the way for the elder brother to buy RCom assets, another on Monday may have taken it away. The National Company Law Appellate Tribunal on Feb. 4 restricted RCom from selling assets without the top court’s permission as the ailing company fights creditors on several fronts. It’s been a prolonged battle. Lenders such as China Development Bank, Ericsson’s local unit and even a PR agency that worked for the company have, at various points, sought to invoke insolvency proceedings against RCom. Local lenders didn’t agree. The banks chose not to take RCom to bankruptcy court because that would have eroded the value of the company more than a settlement negotiated outside bankruptcy, IDBI Bank’s Deputy Managing Director K.P. Nair told reporters in Mumbai on Monday. IDBI is among the company’s creditors. The brothers started out in the same business -- their father’s. After inheriting the Reliance group, the rival siblings in 2005 divided the group in a peace pact brokered by their mother Kokilaben Ambani. Mukesh got control of the flagship oil refining and petrochemicals, while Anil got the newer businesses such as power generation, financial services and the crown jewel, a telecom business which his elder brother had expanded aggressively. 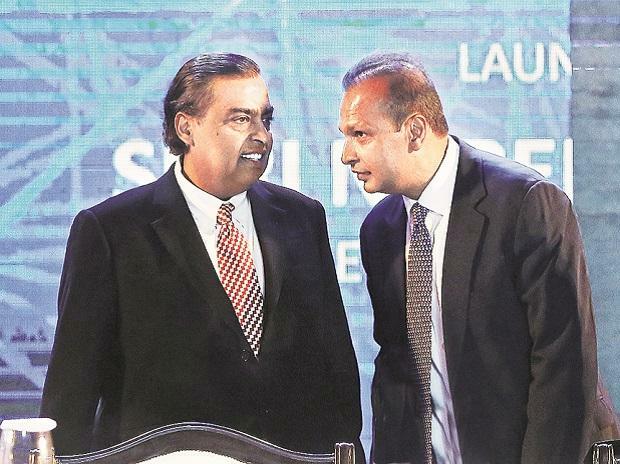 A non-compete clause between the brothers kept Mukesh out of telecoms until the agreement was scrapped in 2010. The elder brother’s return to telecom resulted in the creation of Reliance Jio, which built a speedier 4G wireless network. While RCom slid, Jio stormed ahead, luring subscribers away with free services and cheap phones. The price war took down more than just RCom, forcing several rival wireless phone carriers to quit, merge or go bankrupt. As RCom struggled, it bowed out of the wireless carrier business and pushed for growth in undersea cable services and data centers. Still, the debt piled higher. The price war that helped drag down RCom is also weighing heavily on Bharti Airtel Ltd., formerly the nation’s largest wireless carrier. Moody’s Investors Service cut the company’s long-term credit rating to junk, or non-investment grade, the ratings company said in a statement Tuesday. In lowering the ranking to Ba1 from Baa3, Moody’s cited the competitive dynamics in the Indian telecom market. In December 2017, Anil Ambani said that there would be no write-offs or equity conversion for lenders and bond holders as his company was nearing sales of assets that could provide the cash needed to pay debt. Earlier that year, he had sought patience from creditors and investors, saying RCom’s debt reduction plan would be the largest in India’s history and would create long-term value for shareholders. Lenders had been expecting a 60 per cent write-off on loans to RCom, according to one of the bankers familiar with the negotiations who asked not to be named revealing private information. A voluntary filing by RCom with only one likely buyer in the race could widen that to as much as 80 per cent, one of the bankers said.